Gerard Dussouy is Emeritus Professor at the University of Bordeaux, where he taught various fields of political sciences. His current research concerns Geopolitics, International Relations and Globalization. Next to writing the book that is subject of this interview, Professor Dussouy recently also contributed to two other books. These books are “Traité des relations internationals” (edited by Thierry Balzacq et Frédéric Ramel and published by Presses De Sciences Po, 2013) and “Relations internationals: Bilan et perspectives” (edited by Dario Battistella, Editions Ellipses). The chapter in the first book is about the conceptual changes within geopolitics from positivist and traditional approaches to more pragmatist, complex and reflexive approaches. The other book chapter discusses the emergence of Macro-States as main actors in the new world. 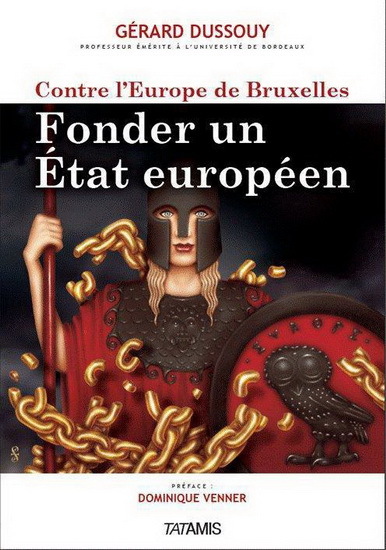 The French title of the book that is subject of this interview is “Contre l’Europe de Bruxelles. Fonder un Etat européen” (introduction by Dominique Venner, published by Tatamis, 2013). This book is short and wants to be a wake-up call. It warns its readers about the systemic crisis that has taken hold of Europe. This crisis has financial, economic, demographic, social and political components and could last many more years. At the same time, the crisis emphasizes the failure of the traditional European nation-states. Their global influence gradually decreases in a world that is increasingly organised around Macro-States. A Macro-State is a country that is very autonomous and influential in world politics thanks to its strategic resources (military, economic, monetary, demographic, cultural and political). In my view, the US is a Macro-State, while China is becoming one. My book argues that, as a consequence of globalization, founding a single European State would prevent the decay of Europe. In other words, it would be the only possible way forward for Europeans. The book discusses threats and challenges that a traditional nation-state is not able to address on its own. It then stresses the historical necessity of a single European state. The uniqueness of political and strategic power is a vital question. Europe needs, as during the Hobbes’ epoch, a new Leviathan with the capacity to restore the public power. It should further create a European social pact and define an economic strategy that serves the interests of the people, and not those of the global market. The new European state would become a Macro-State and initially be formed of two, three or four of the traditional nation-states. It would be impossible to immediately include the entire EU. Eventually, the new European state should welcome all countries of the continent, including Russia. The very great cultural diversity of the European nation-states poses another challenge. Therefore, the new European State should have a federal structure. Then we could speak of a European federal Republic. My approach is pragmatist, similar to the one of the American philosopher Richard Rorty. It contextualizes and has a holistic nature, without universal, national or ideological prejudices. The approach is still inter-ethnocentric indeed, because each context is subject to multiple interpretations. Each actor has its own set of values and interests. Yet, my approach has both systemic and strategic features. Transformation (structural change): Power moves away from political and military factors towards economic and cultural factors. A key finding concerns the inexorable decline of the European nation-states. This decline is highlighted by various cycles. Another finding is that it is likely that the traditional European civilization will disappear as a consequence of immigration and the emergence of new hegemonies elsewhere in the world. The books argues that the only alternative for Europe to face the challenges of globalisation is to construct a single European state with a federal structure. I consider this book part of the academic literature about geopolitical transformations of the world (more broadly: International Relations). These transformations affect the nature of the international system (anarchy or world society), its structure and its configuration (unipolar, bipolar or multipolar). The book also reflects on the possibility of cycles in the world system. It integrates ideas that Robert Gilpin introduced in his work “War and Change in International Politics” (1981). My book raises a related question: assuming that the Westphalian cycle has now ended, is the new one a more complex, hegemonic cycle, or a return to a cycle of empires? The book summarises my rather negative reflections on the future of Europe. These reflections are based on the research that I conducted during my career as Professor. My book seeks to be a guide for action, and not to affect the research agenda of other scholars. Nevertheless, I would encourage other scholars to examine themes that are related to the challenges that a European federal state would face.